1) The Turk had prepared to invent - - Cyprus. 2) othello had promoted cassio to the rank of--- lieutenant. 3) Othello accused desdemona of being-- Unfaithful. 4) Othello's first gift to Desdemona was - - - - handkerchief. 5) in describing othello's restlessness the drugs Shakespeare nelson's As failing to bring him Peace of Mind are----poppy and Mandragora. 6) Igo was - - - crafty. 7) othello was highly esteemed and revered because-- he was a valiant Soldier. 8) Desdemona was the daughter of - - - Brabantio. 9) who was accompanied by Othello to Cyprus? - - - - desdemona. 10) when othello became aware of his guilt, he killed himself with his-- sword. 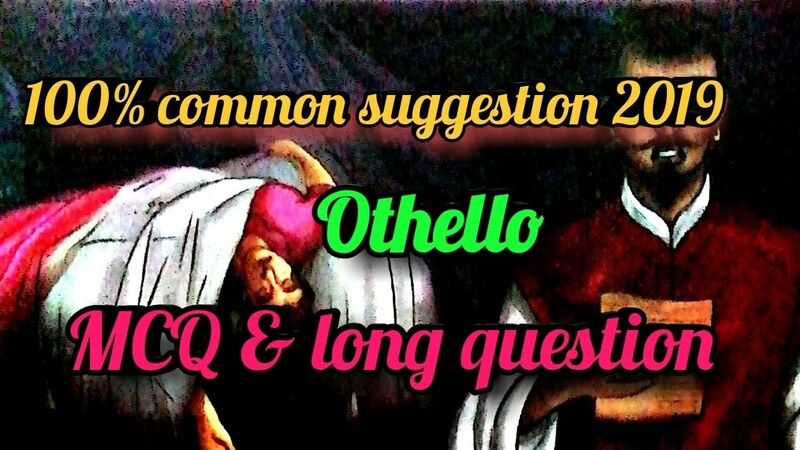 Ans : Othello secretly married Desdemona without taking any consent from desdemona's father Brabantio. When he came to know about it Brabantio became Furious and complained to the Duke that othello had won the heart of his daughter by sorcery and witchcraft. When othello was summoned before the senate to speak against the complaint in self- defence, he talked about his genuine love for Desdemona. He spoke so eloquently and with so sweetness that the Duke himself was very much impressed and remarked that her own daughter would have been impressed with such eloquence. Thus the complaint of Brabantio was not accepted by the Senate and he was compelled to accept othello as his son in law. Ans : Michael cassio was a young handsome and energetic florentine soldier in the play' Othello'. He was supported one of the worst victims of Iago. Cassio was the man of good spirits, romantic and articulate. Othello , the Moor was afraid of the fact that he was incompetent to get the favour of woman. On the other hand Cassio possessed the quality, so, Othello had engaged him In their courtship. He played a significant role in this regard as both Othello and desdemona believed him their true and genuine friend. After their marriage Cassio paid his visit to their house frequently. Othello , a man of strict principal liked his free and eloquent speech. Desdemona valued him as friend. Desdemona and Cassio would talk and laugh together as they did before Cassio was promoted to the rank of lieutenant. Ans : Othello, the tragic Hero gifted the strawberry spotted handkerchief to her beloved wife Desdemona. It belonged to his mother. The handkerchief had a special significance and symbol. The envious Iago made a conspiracy and took entry with a revengeful motif to ruin Othello, Desdemona and Cassio. He used his wife Emilia who was engaged as Desdemona's maid to steal the handkerchief from her. The handkerchief was dropped at Cassio's way. In this way Iago implanted the germs of jealousy illegal and made othello suspicious about the illegal relation between his wife and Cassio . The handkerchief represents Desdemona's Fidelity when othello gets the handkerchief in Cassio's possession , he disbelieves desdemona's faithfulness. The Furious and outrageous Othello brutally murdered Desdemona by strangling.